Just because it can be awkward doesn't mean it has to be. This is a guest post by Jamie Scuka. If you’d also like to guest post here on JobMob, follow these guest post guidelines. You know the feeling when you get off the phone after setting a date and time, you are feeling great, yet really nervous? Kind of sounds like a first date right? Or, is it a first interview? You have finally done it, made a step in the right direction after being attracted to an opportunity that you feel is perfect for you (at least at this stage in the game). Good for you! How exciting! Or is it? 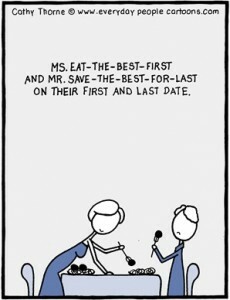 A first date and a first interview are pretty much one in the same. Nobody really likes interviews; not only candidates, but especially hiring managers. It always seems like pulling teeth to get an interview confirmed on their end, and it’s because it's the last thing they want to do even though they have a defined need. And as far as first dates are concerned, many of us have that one story about the blind date gone wrong, or the nightmare first date that you could never forget. They both can be very awkward for all involved, but if you approach a job interview like a first date from both sides then you will have a better handle of the interview, and the familiar flow will make it seem like second nature (even if it still is awkward). Have you ever been on a first date and not cared about your appearance? (if you answered yes to that question, send me an email and please tell me how that went, I would LOVE to know) You know that you only have one chance to make a first impression, so the pressure is on. Why would you not think that way in a job interview? I hate to say it, but hiring managers find stupid reasons to disqualify you even if you could be the perfect fit. Please don’t let your wardrobe choice throw you out of the running even before you started the race. If they say you don’t have to wear a suit, you should STILL wear a suit. You should always go above and beyond and this point. And, who knows? If all the other candidates listened to them, they'll remember the one who looked sharp in a suit. Same rules apply in regards to number one. Your date is probably just as nervous, and if you let them sit there alone for some time waiting for you, a whole list of scenarios can play out, and at that point they have already painted a picture of you in their head, and it’s not to your advantage. Same thing goes for hiring managers, again you are painting a picture of an irresponsible, tardy employee who wastes their time. Remember- don’t get kicked out of the race before it has begun. How awesome would it be to be on a first date, and you just kept asking questions, and the other answered, all the while just talking about themselves? Doesn’t sound like a great way to begin a relationship, now does it? Engaging the other party gives them the sense that you truly are interested, and want to know more. Like I said earlier, interviewing is not exactly a hiring manager’s favorite thing to do, and candidates never engaging them is probably why. It is very important to “interview” hiring managers as well. Do your research about the company and the individuals who are supposed to interview you. For example, ask helpful questions like, “Why did you decide to work here and why do you enjoy it?” or “If you were me, what about the company do you think is most appealing? It emphasizes to the interviewer that this is a HUGE decision for you and your family too, not just a decision for them. In dating, you move forward when you feel there is a mutually beneficial connection; likewise in an interview. This happens in interviews all the time. The difference is the way that you handle it, as in quitting while you are ahead. If this happens during a first date, you can more easily overcome it by realizing that you are both human, and can probably turn it into a good laugh and recover. In a job interview, if you don't humanize the situation, it will be a lot harder to overcome a “rabbithole of a tangent” where you just keep babbling and ultimately look foolish. In addition, you may be giving your interviewers ideas that they will essentially steal from you even if you aren’t hired. I know that seems harsh to say, but the reality is it does happen. If you approach it the same way as you would a first date, you will be able to think about it, maybe even get a chuckle, and get the interview back on track. Without divulging too much information, yet just enough that they are intrigued to bring you back in and hear more. We all know that scenario: you have a great date with someone, and you are feeling awesome and can’t wait to see them again, but you say to yourself, “Oh wait! I don’t know when or if they will call, we never clarified that”. You are stuck wondering, and it can really play with your head. However, if you end your date with a clear understanding of when you will see them again, you won’t be as confused about what’s next. You might say something along the lines as, “I had a great time and feel we have a lot of things in common, don’t you agree?” and when they answer, you can answer accordingly. Speaking optimistically, if they say yes you might say, “Great, then when can I see you again?” At that point you can determine whether you are on the same page or not, and uncover any doubts they may have. “After our conversation, the qualities and skills you are looking for in a candidate align with my background and skill set, so I feel I would make a great fit for your role. Would you agree?” Again, if the interview went well, they most likely will agree. Then, you would say, “Great, when do I start?” Many hiring managers may laugh, which is good as it lightens the moment, yet it can also provide an opportunity to uncover any doubts they have. Tweak this banter to your own personality and the vibe of the conversation. Ultimately, this should give you a good understanding of the next steps in the process. So, the next interview you have, really take the time and think about how you would approach it as a first date. I know it seems somewhat strange, but in essence it’s a great strategy to help you ace your interview. There is an old saying that “I am married to my job”, and quite honestly as much time and energy you spend there, it does have a lot of truth to it. That being the case, the only way to make a step towards a mutual commitment (marriage or job) is the first step, the first date. Jamie Scuka has extensive experience with small business, talent acquisition, and social media. She has developed and optimized numerous websites in addition to implementing content marketing strategies. You can check our her blog at www.smallbizbabe.com, find her on LinkedIn and follow her on Twitter @smallbizbabe. If you want Jamie Scuka to win, share this article with your friends. Subscribe to JobMob via RSS or email and follow Jacob Share on Twitter for more out-of-the-box job search talk. I got a DNS error when trying to go to Jamie’s blog. Shalom- her blog is fairly new and is being actively developed. It was definitely up a few days ago, I’m sure it’ll be back soon. How about this one… Don’t share disparaging remarks about your EX (girl/boyfriend or employer)! Caroline- thanks for sharing. What about you?